HAL peripherals are assistive devices with which combined use of HAL for Lower Limb provides safer and more effective gait training. HAL Tread is the specially developed treadmill in order to provide effective walking exercise to the wearer of HAL for Lower Limb. As a hanging frame to support the wearer’s trunk and a treadmill are combined, without further environmental improvement, gait training can immediately be started safely at ease. ※HAL TREAD's specifications and accessories may be changed without notice. 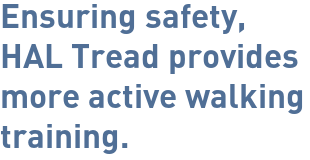 The purpose of HAL Tread is to carry out safety and smooth gait training with a treadmill, by supporting the trunk of the wearer. This device is able to support the trunk of the wearer during gait training. * This is not a relief device. *1 The guarantee only covers defects that attribute to manufacturing. Contact CYBERDYNE Inc. with regard to other repairs and services. With All-in-One, even a person who has instability in a standing posture can comfortably and safely enjoy walking without limitation of a walking area. A battery driven lifter that can instantly adjust the extent of relief is suitable for various types of people regardless of body shapes and training levels. 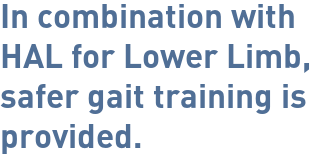 Combined use of All-in-One with HAL for Lower Limb (NON-MEDICAL) provides safer gait training. *1 One time recharging enables the device to perform lifting approximately 60 times.